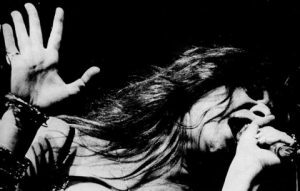 Janis Joplin performing, from a trade ad for her Greatest Hits album, which was released after her death. Why are so many celebrities willing to sacrifice who they are in order to achieve success and fame? Jan Aitken, a life coach based in Dunedin, New Zealand, recently pondered this question after watching a documentary about Janis Joplin, whose stellar career as a blues singer was cut short by a heroin overdose in 1970. She also wondered about the line from Pink’s “Don’t Let Me Get Me,” “LA told me, ‘You’ll be a pop star, all you have to change is everything you are.’” All told, Aitken wonders if being a superstar is a “rubbish job,” especially for someone with a more introverted personality. Of course, celebrities aren’t the only ones who are tempted to change the way they speak or behave or the opinions they express based on who they’re with. Though adapting to one’s surroundings is beneficial, and though it is wise to know when to keep one’s mouth shut, we run the risk of becoming fake, insincere, or hypocritical people when we constantly keep our true selves under wraps. These days, while our physical safety is not at risk in the same ways, our emotional safety can take a battering if we find ourselves rejected by those around us. We are scared to show who we genuinely are. It seems that most of us still need to feel we fit in. But by not being authentic or genuine we may be doing ourselves harm. We may think “It’s OK, I don’t want to hurt their feelings” or “It’s just a little white lie.” We may be perceived as easy going, but by changing ourselves to fit in, we don’t value our own thoughts and opinions, they become worth less than those of other people. We batter our own self-esteem and our ability to communicate honestly and openly with others is compromised. We change what we say and do, always worrying that we might get it wrong and be disliked. That’s an exhausting way to live. Something tells me the Samaritan woman had a hard time being herself. Her life, it seems, was a mess. She’d been through a string of failed relationships. We’re never told what happened with her former husbands, but you can bet everybody in town had a theory…or a juicy piece of gossip. She was shunned by the other village woman, probably coming to draw water at noon to avoid the crowds that would be at the well earlier in the day. Rejection may well have been a daily fact of life. Being at the center of a small village’s rumor mill was a rubbish job if there ever was one. It’s a good thing Jesus came along, not with further condemnation but with an offer of living water. Jan Aitken, “To Be Yourself,” Otago Daily Times, 23 May 2016 http://www.odt.co.nz/lifestyle/magazine/384072/be-yourself. • What did Jesus do to let the woman know he was “safe”? • When have you seen someone wear an emotional mask? Why do you think people do this? • When have you feared to let the real you be seen? • Is it safe to be yourself at church? Is it safe for people with different life experiences, lifestyles, or beliefs? Explain. • How does transparency about who we really are further God’s work of transforming us into the likeness of Christ? In the NT it is clear that Jews and Samaritans shared a common heritage (John 4:12), but differed on the proper place of worship, Jerusalem or Mount Gerizim (John 4:20). Because they interpreted the requirements of ritual uncleanliness and cleanliness differently, they avoided contact with one another (John 4:7-10). Sometimes this avoidance came to expression as a contempt of Samaritans by Jews, as for example in John 8:48, where Jesus’ opponents called him “a Samaritan, and you have a demon.” Jesus himself seemed to believe that Samaritans, like gentiles, did not belong to the “house of Israel” (Matt 10:5). Furthermore his pilgrim itinerary in Mark 10:1 and Matt 19:1 seems to follow a long-standing pilgrim route that avoided Samaria. In one other text, however, he was rejected by a village of Samaria on the grounds that he planned to travel through Samaria to Jerusalem (Luke 9:53). The Jewish/Samaritan separation is reflected in the word “foreigner” (allogenes) that Jesus used for the Samaritan leper that he cured (Luke 17:18). This term is found on the extant Greek inscription from Herod’s Temple from the barrier that separated the Court of Gentiles from the Court of Women (“No foreigner [allogenes] shall enter…”). Josephus mentioned these inscriptions and used the same word (BJ 5.5.2). Josephus explains that Jews excluded Samaritans from the temple mount because of Samaritan acts of vandalism within the temple precinct. James F. Strange, “Samaritans,” Mercer Dictionary of the Bible, ed. Watson E. Mills et al. (Macon GA: Mercer University Press, 1990), 790. What better way is there to create religious tension than to ask which is the best place to worship, especially since the Jews had destroyed the Samaritan temple? Carson, however, apparently thinks such an explanation is too psychological…. But I think there is more to the story than Carson sees because Jesus did not fall into the trap of a changed subject. Instead, he once again turned the discussion from the level of earthly institutionalism (v. 21) to the realm of the divine goal (hour) for worship and to God who is the subject of such worship (v. 23-24). Moreover, he reminded the woman that proper worship, like salvation, is a matter of divine revelation (from the Jews) and not a human construct concerning a God who is unknown (v. 22). It was a stinging rebuttal of Samaritan worship. The woman’s next response (v. 25) is intriguing because she has been moved in her concern to speak of the future era. Yet it is not entirely clear if she is using messianic talk to counter the rebuttal of Jesus by reminding him of a higher source for information (i.e., the Messiah) since she had already politely acknowledged him as a prophet. Or is this statement her honest anticipation? One thing seems clear: she had not yet connected Jesus with the Messiah or the coming of the messianic age. That connection Jesus quickly made is an important self-identification. English readers of most translations may not recognize that the Greek at v. 26 is ego eimi (I am), the primary thematic self-designation of Jesus for his role as God’s anointed one (Messiah) in this Gospel. Gerald L. Borchert, “John,” Mercer Commentary on the Bible (Macon GA: Mercer University Press, 1995), 1053.